As I promised, more information about the prizes. ezBanners will be the prize for the first contest. Easy installation, just upload and activate. Multiple banner management, you can add as many banners as you wish and they will all be shown randomly. 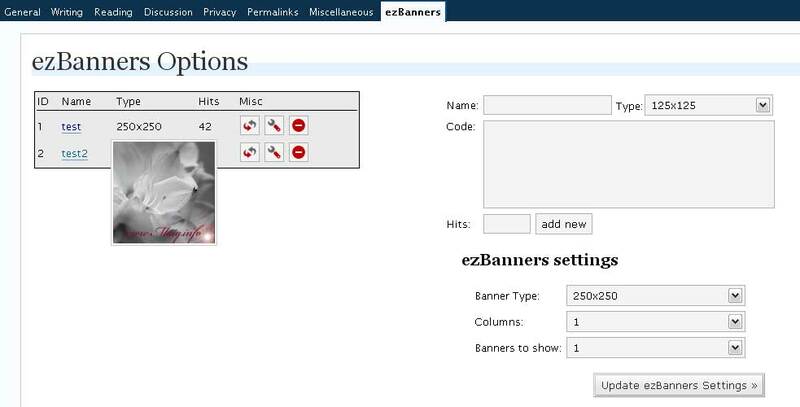 You can use 250×250 or 125×125 banners (of course you can put 300×250 in stead of the 250×250 if you have room for it). You can choose to show one 250×250 banner or 1 to 9 125×125 banners. You can choose to show one column or two columns. Hit count – every time a banner is shown its hit count will go up. Easy edit/delete/edit banners or reset the hit count. Let us know how much it costs in case we DON’T win! This competition has been blogged about on blogetition.com – the home of blog contests and competitions.